Pretty sure this Bench HOH is 1970 with the Big Wheel web and No Lite Toe...pretty cool. I've seen one just like it with a Ed Begely endorsement. Also a HOH. I like it! I agree with NLT. You've gotta love the look of the older mitts. It appears I have four of five of that display. The HOHX is a killer! 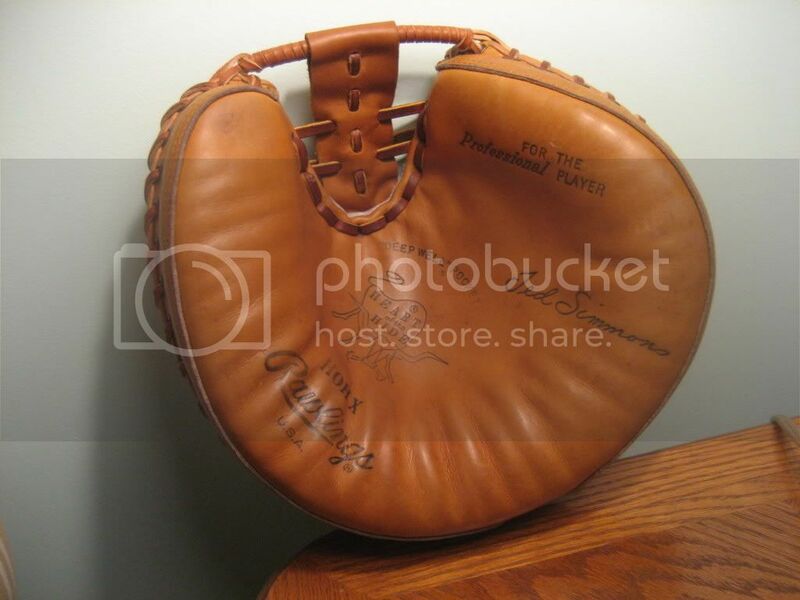 Had one as a teen catcher from '68-'71, then it got stolen. Now I have one that's mint and one not so mint, but in great shape. The mint one has a Ted Simmons endorsement which I thought was odd. Maybe it was the last year they produced them. They're hard to come by these days. Lileague, if you ever want to do business over that mitt shoot me a pm. Enjoyed the pic of your mitts. Thanks for posting them. 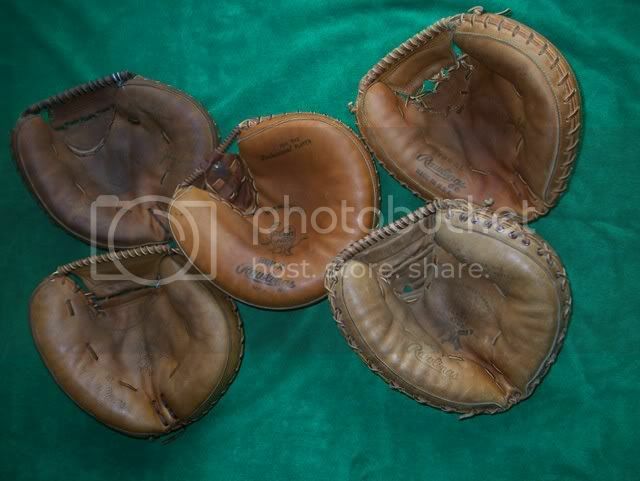 No-Lite-Toe, I too was a catcher in my Little League days and still have my Rawlings USA Johnny Bench. I was thinking of relacing it (it has its' share of temporary lace repairs) but I decided not to and leave it just how I had it as a kid. I did clean it up though and conditioned it. Lots of blood, sweat and tears in that baby. It's all part of the romance. I finally did it!!!!!!!! After all this time. But so huge. Anyway this is one of my pride and joys. Ted Simmons HOHX. With a custom made web by yours truly. Was hoping a total of six pictures would come thru. That's all right I'm lucky I got this one in. That is awesome! Looks like it would take 2-3 years to break that baby in. What was wrong with the stock web? A couple of mine have some rust and leather detioration. I never liked the design of the stock web. Plus that's the part that always seems to go first. With some noticable cracking, and around that rivet area there's always some discoloration. I never understood the point of the rivet being there. So, with this mitt, as pristine as it is, it had the same web symptoms as metioned above. Thanks for the compliment. Oh yeah it would take a while to break in. But I wanna keep it as is.